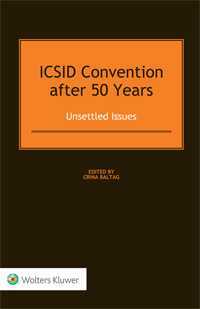 ICSID Convention after Fifty Years: Unsettled Issues celebrates the fiftieth anniversary of the Convention on the Settlement of Investment Disputes Between States and Nationals of Other States (ICSID Convention or Convention) with an overview and analysis of the International Centre for Settlement of Investment Disputes (ICSID) case law to date and, focusing particularly on unsettled issues, assesses possible developments in the institution’s next phase. The ICSID has played a leading role in establishing the field of foreign investment law. It is primarily due to the ICSID that it is no longer peculiar for individuals and corporations to have legal standing in claims against governments – probably the most notable development of international law of the past half century. Now, in its fiftieth year and ratified by more than 150 states, the ICSID received its 500th case in 2015. The cases involve a broad spectrum of international economic matters, including provisions of the Energy Charter Treaty, exploitation of natural resources, electric power, transportation, construction, finance, communications, water, sanitation, agriculture, fishing and forestry, and service and trade. As a detailed response to the question whether ICSID has contributed as promised to an improvement in the investment climate and promoted the flow of private foreign capital – and as an assessment of the present and future feasibility of the ICSID system for the resolution of investment disputes by arbitration and conciliation – this book has no peers. Considering the current crisis of investment law, the book’s immediate value, not only to investors and their counsel but also to practitioners and academics, in the field of investment law and arbitration, and public international law cannot be overstated.